Pakistan: Vaccination Kills Two, Injures Half a Dozen Children - Word Matters! Update: Conflicts in media reports are worth noting since the death of the two children and injuries of others after vaccination in Bara/Khyber Agency. Pakistan’s popular English daily The News reported that it was actually measles vaccine that caused the death-and-injury of children as against earlier reports that polio vaccine did the harm. Who is telling the truth and to what degree and effect is unclear. Vaccines continue to kill and injure children across the world and Pakistan is one of the countries with recurring vaccine casualties and injuries. In the latest incident, two children reportedly died and six others hospitalized after vaccination. The news of the death of children spread across social media posted by locals first, before the professional news sources got to it. Dunya News reported the death of two kids due to “vaccine injections and drops” in Bara, Khyber Agency, which is Peshawar’s neighboring tribal area. The report tells that the children were rushed to a hospital in Hayatabad area after they had a vaccine reaction. 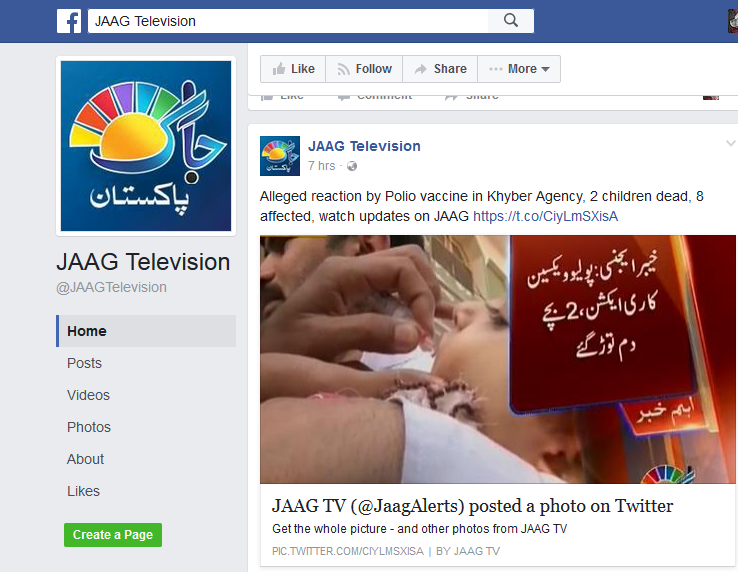 Khyber News also posted about the incident calling it vaccine reaction that killed the two children. Interestingly, it quoted the coordinator FATA Cell EPI, saying that an investigation has been started to ascertain the “real cause of the deaths”. Under the push by the World Health Organization (WHO), the current Pakistani government has criminalized refusal to administer polio vaccine and parents are routinely harassed and even arrested by police when they refuse to let their children be vaccinated. But when reactions of vaccines happen, causing deaths and disabilities, authorities don’t conduct any honest and scientific investigation; the news just dies down soon in media, and nobody cares.